"Girls Winding Armatures," from "Westinghouse Works"
Advertising. Promotion. Propaganda. Whatever you want to call it, it starts here. In 1904, the Louisiana Purchase Exposition in St. Louis drew nearly 20 million visitors. 63 countries, 43 states, and dozens of private concerns displayed their wares on 1,200 acres of grounds. Westinghouse Electric, then Edison’s major rival in power generation, wanted to promote itself nationally in as flashy a manner as possible. How better than to use the most cutting-edge technology available? At that time, the answer was movies. They hired pioneer cameraman/cinematographer G.W. “Billy” Bitzer from the American Mutoscope and Biograph Company to make a series of films chronicling the industrial processes at their Pittsburgh headquarters. This he did between April 18 and May 16, racking up 29 three-minute “actualities” that played in rotation at the Westinghouse Pavilion at the Fair that year. 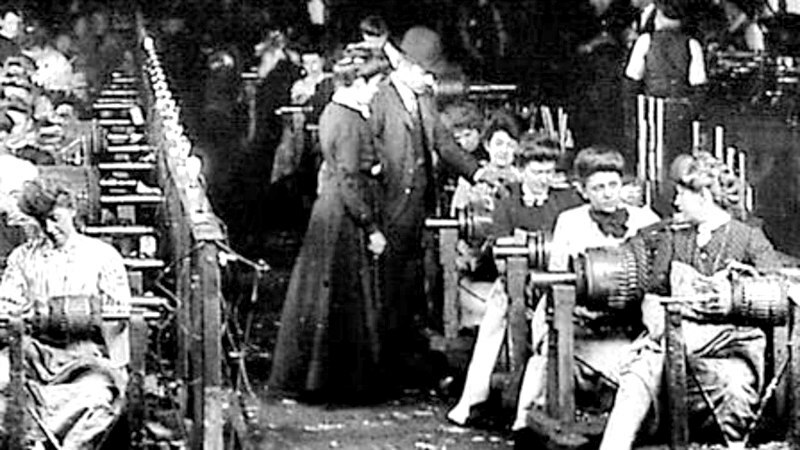 The films cover such subjects as assembling a generator, testing a large turbine, working a red-hot chunk of steel with a steam hammer, female employees (here called “girls” winding armatures), along with a few “panoramic” shots that are actually rudimentary dolly shots, made using factory hoists and cranes. That Bitzer could get indoor shots of these closed, cavernous spaces at all was due to the recent invention of the mercury-vapor lamp. The footage is pure documentation, with no aesthetic ambitions. However, it preserves the sense of how imposing and grand that phase of American industrialism was, when the country still possessed the means of production and served as a workshop to the world. Small figures walk around the huge pieces of machinery, tending them, tweaking them. Associations rise in the mind – here are Alberich’s dwarves, hammering deep in Nibelheim; here are the machine rooms of Lang’s “Metropolis,” and the incipient Morlocks of H.G. Wells. On the other hand, these aren’t slave laborers, these are upwardly mobile working people who probably made good money for what was highly skilled labor at the time. And in some frames, little human idiosyncrasies surface – the slight but distinct differences in the ladies who are clocking in to work in a seemingly endless row, the way a man taps a valve, a foreman’s saunter down an aisle. There is conformity on display, and drudgery, but there’s power and innovation too, the sense that, in concert, groups are quite literally forging a new world in front of our eyes.